Over two billion people worldwide are at risk for the spectrum of disorders known as "The Iodine Deficiency Disorders." 1-10% will suffer cretinism; 5-30% will have some sort of brain damage or neurological impairment and 30-70% will be hypothyroid. The causes of iodine deficiencies can be considered from both simplistic and more complex perspectives: From the leaching of iodine from soil resulting in crops with low iodine content to malnutrition resulting in impaired iodine absorption. Poor dietary diversification and impoverished socio-economic development can also lead to iodine deficiencies. Although it is possible to diagnose and treat deficiencies, there is still an ongoing dialogue regarding the detailed molecular pathology of iodine homeostatis, how hypothyroidism impacts the body tissues, and efficient diagnosis and treatment of the Iodine Deficiency Disorders. This Handbook provides a resource of information on the various pathways and processes based on different countries or diseases. 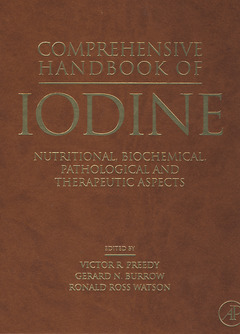 Because there is a constant flow of new information on iodine and related disorders, the goal of this Handbook is to provide a base of scientific information upon which additional knowledge can be applied.